How to perform Live Exchange Migration? Why do I need EdbMails Live Exchange server Migration? How does the EdbMails Exchange server Migration work? Is migration from Office 365 possible? Is there support for migrations from Hosted Exchange Server? Can the application migrate encrypted emails? Standard folders (such as Inbox, Calendar, Contact etc.,) on my source Exchange server mailboxes are initialized with different language. How do I migrate these folders by mapping the respective system folders on target (destination) server? Is migration between exchange servers running different language supported? What is the licensing model of EdbMails for Exchange Server Migration? How does EdbMails Live Exchange migration license works? How to migrate Live Exchange server 2010 to 2016? Is it possible to purchase additional licenses after the first purchase? What types of data can EdbMails for Exchange Server Migration migrate? Where can i install EdbMails for Exchange Server migration? Is there any size or speed limits for the migration? Is a direct migration from Exchange 2003 to 2013 possible? Can EdbMails migrate Public folders? Can Public Folders in same Active Directory Forest be migrated? Will EdbMails delete anything from the source server? Can I continue using the Source mailboxes after migration? Some target mailbox addresses are missing from the list. What to do? Can mailboxes within same domain be migrated using EdbMails? I am faced with an error/have some questions, what to do? EdbMails Exchange server Migration takes the most critical part of a server migration or Exchange upgrade - moving of user’s mailboxes as well as public folders - off your back. EdbMails automatically performs a direct migration of the mailboxes you selected on the source and mapped to target server. (without modifying any items on the source server). Yes, you can do in a simple way. Later you can purchase the license for full version of Live Exchange Migration tool; you can resume the migration and move all remaining items incrementally. EdbMails for Exchange Server Migration works by accessing all the mailboxes in your source server and then migrating each of those mailbox data to mailboxes on the destination server. With EdbMails, you can easily map all source mailboxes to mailboxes of your liking on the the target server. To achieve migration, EdbMails requires you to give impersonation rights to a exchange server user in both the source and target server. Yes EdbMails for Exchange server migration supports migration from your Office 365 tenant. 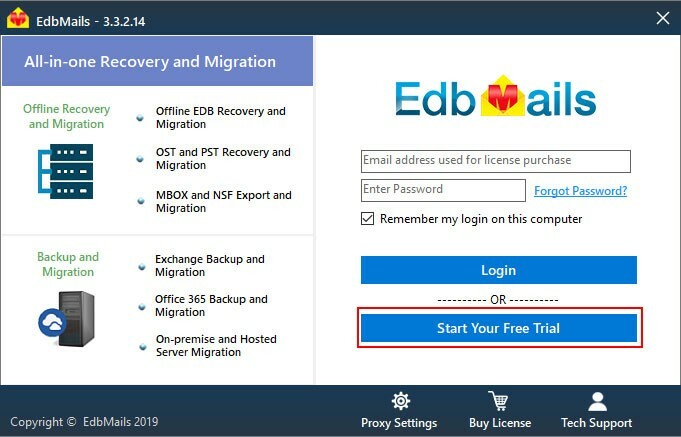 Using EdbMails, you can effortlessly migrate from Office 365 to Exchange Server version 2019, 2016, 2013 and 2010. Yes EdbMails supports migration from Hosted Exchange. If your organization is running Hosted Exchange services on Rackspace, Godaddy etc and are in the need of migration then EdbMails can easily accomplish seamless migration. Yes it can. EdbMails supports migration of all emails on the source server whether it be encrypted or regular. All the source server mailboxes are migrated “as is” to the target server. Yes, EdbMails has extensive support for Non English Unicode languages. This means that you can migrate your data between source and target servers irrespective of the language. EdbMails will also ensure that all special characters are migrated to the target servers without anything being left out. EdbMails is licensed per mailbox for Exchange Server migration. Live Exchange migration license works based on how many mailboxes you want to migrate. That is, if you want to migrate 200 Mailboxes to a different domain then you just need 200 Mailboxes license. And you can use this license to migrate same mailboxes repeatedly for lifetime. How to migrate Live Exchange server 2010 to 2016 ? Yes, you can easily purchase additional licenses for more mailboxes after the initial purchase using our order page. EdbMails can migrate all emails, journals, tasks, calendar, contacts, notes, public folder, archive folder from the source server to target Live exchange server. You can install EdbMails Exchange Migration tool on any computer that can access both the source and destination servers. EdbMails for Exchange server migration doesn’t impose any restrictions on the size of the mailboxes/ items that can be migrated or the speed of migration. Nevertheless, the target exchange server may have its own mailbox size restrictions and throttling policies that limit connection speed which EdbMails cannot override on its own. It is not easy to predict the duration of migration process as it will vary significantly depending on a number of different factors involved. One important thing to note here is that EdbMails Exchange Server migration tool does not in anyway affect the migration speed. However, other factors such as the internet speed, router capabilities, configuration of the computers involved, connection speed throttling in the source and target servers etc can affect speed of migration. Yes, using EdbMails for Exchange Server migration, you can directly migrate all your exchange 2003 mailboxes to exchange 2013 with ease. 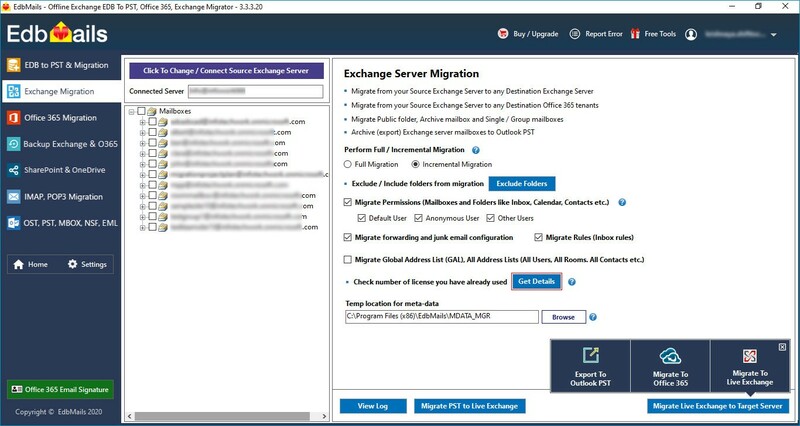 Since Exchange 2013 does not support coexistence with Exchange 2003, you will have to opt for cross forest staged migrations when using native utilities, however EdbMails helps eliminate all this complexity by enabling direct migration from exchange 2003 to 2013. Yes, EdbMails Exchange Server migration tool is fully compatible with Office 365 Multi Factor Authentication. You can migrate from your MFA enabled Office 365 account using the Microsoft app-password instead of normal password. Yes, EdbMails Exchange migration tool supports mapping of source mailboxes to required target mailboxes of the user’s choice. 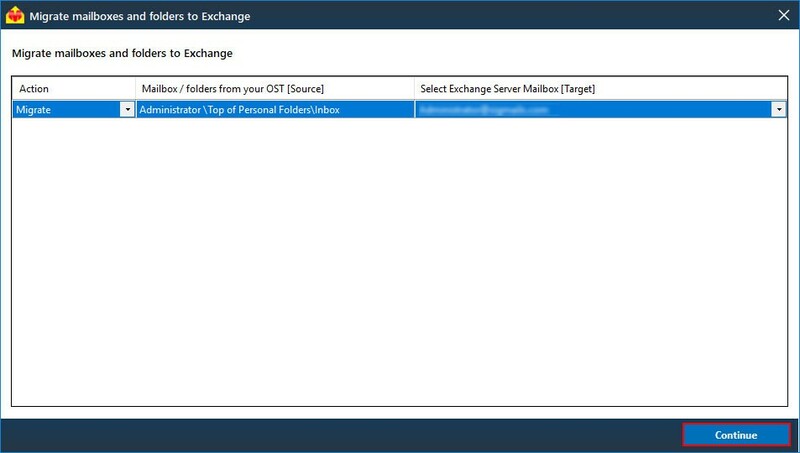 EdbMails allows you to select appropriate source and target mailboxes during Exchange Server migration. For this, select the mailbox from the list of mailboxes/folders that are selected for migration and choose target mailbox from the right pane as shown in the below screen. 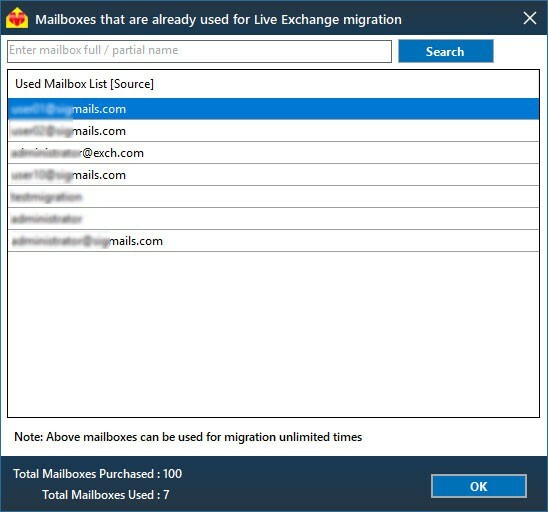 Yes EdbMails Live Exchange migration tool can migrate all your Public folder contents to target server. All you have to do is create Public folder and assign users to this Public Folder on target Exchange Server, EdbMails will replicate the source server Public folder structure exactly as it is, on the target server. No it not possible as Exchange server does not allow creation of more than one Public folder in the same Active Directory Forest. No, EdbMails does not alter the data in the source server in anyway. No mailboxes or other items will ever be deleted from the source server as EdbMails acesses the server only to migrate data to target server. Yes you can. EdbMails does not alter the contents of source mailboxes in anyway and this ensures that you can keep using the source mailboxes as you normally would even after migration process. With EdbMails incremental migration, only the new items that are created in the source server after first full migration can be migrated to target server again without having to repeat the full migration. In some cases especially in cross forest migrations all the target server mailboxes may not get listed. For this, you have to generate a .csv file containing all the mailboxes in the server and import it to the application.Execute the below Exchange Management Shell (EMS) commands to generate the CSV file. Yes you can mailboxes within same domain using EdbMails if the the UPN (user principal name) of the source and target mailboxes are different. For example if the source and target servers have a user mailbox with the name alex.joe@domain.com then you have to create a different mailbox for the same user in the target server ,say , alex.j@domain.com to be able to carry out the migration. NOTE: All the Microsoft’s coexistence limitations for various exchange server versions still apply and only cross-domain direct migrations are possible in all such cases. For any queries about using the EdbMails Exchange Server Migration tool, please refer to our FAQ page which contains commonly asked questions and their solutions. However if the FAQ doesn’t answer your query or solve your issue, you can contact our Technical support team via email, Live chat or phone 24x7 on all days.